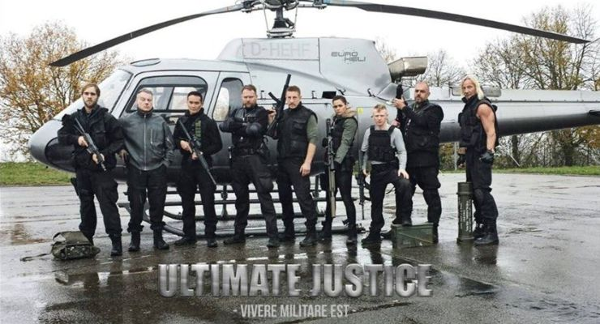 “Vivere militare est” is Latin for “To live is to fight”, and it’s both the motto and the inspiration for the name of VME Security, a private security agency run by ex-soldiers Gus (Mark Dacascos) and Hans (Wolfgang Riehm). They handle tough jobs for those clients who can afford their no doubt expensive fees, but when an attempt to resolve a kidnapping ends with two of the VME team dead, Gus decides he’s had enough and persuades Hans that it’s time to sell the company and retire. And retirement starts out well for both of them — at their retirement bash they meet all sorts of beautiful women, with Michaela (Sandra Tauro) in particular very interested in Hans. One whirlwind romance later, the two of them are married and settled down with their young daughter Annika (Fabienne Daumler) who calls her dad’s old friend Uncle Gus. But all isn’t entirely well; Hans has been to see the doctor several times recently and won’t confide in either his wife or his friend, saying only that everything is fine. Soon, however, nothing is fine. Masked men break into the mansion, and when Hans tries to stop them he’s severely beaten for his pains. Worse, Michaela is attacked and shot and little Annika carried off kicking and screaming into the night. From his hospital bed, Hans asks Gus to find his daughter, and of course he can’t refuse. But the old team has long since gone their separate ways, and though Hans would rather Gus fly solo, Gus thinks it’s too big and important a job for that. So he searches them all out, finding some of them in very odd places — the giant Radowsky (Matthias Hues, Star Trek VI), for example, is working in a fast food restaurant while Henry (Henry Muller), a bare-knuckle street fighter sort, is with the police. Benny (Mike Möller), the “little guy” — though you probably shouldn’t say that to his face — works at a gas station. And Doc (Brandon Rhea), their former medic and expert torturer, is now trying to cleanse his soul in a monastery. With the addition of the sniper Julia (Yazmeen Baker) who happens to be Doc’s old flame and tech expert Flo (Martin Baden), the survivors are all here and working on the case. It isn’t like the old days, though — the mission isn’t going well and there’s a serious possibility they have a traitor in their ranks. Gus isn’t one to give up, especially not with a child’s life at stake, but this is one mission they may not be able to complete. As you might expect, the movie is almost wall-to-wall action, and it’s entertaining action. I’m not normally a big fan of fight scenes, but Mike Möller, who was also the fight choreographer, must have had huge amounts of fun arranging the scenes because they were very enjoyable to watch. Several times I half-expected Jackie Chan to join in, though admittedly the body count here is much higher than in most of his films. But this team has worked together for a long time, and you can see it in the way they fight side by side. The camaraderie among the team was excellent, even when the possibility of betrayal starts to cast a shadow over all of them. Rhea steals many of his scenes as he’s plagued by doubts and struggling to do what’s expected of him, while Dacascos manages to be both a calm, respected leader and an unabashed ladies’ man. Most of the deeper questions raised are only glossed over, but as an action thriller it’s a solid one with a great ensemble cast and some satisfying twists that make it well worth watching for any fan of action movies.